'00 TJ build, new to links and TJ's. Lots to do. Hello Wrangler and TJ fans. I just sold our family CJ5 in order to have more room, go more places and be more comfortable while doing it. 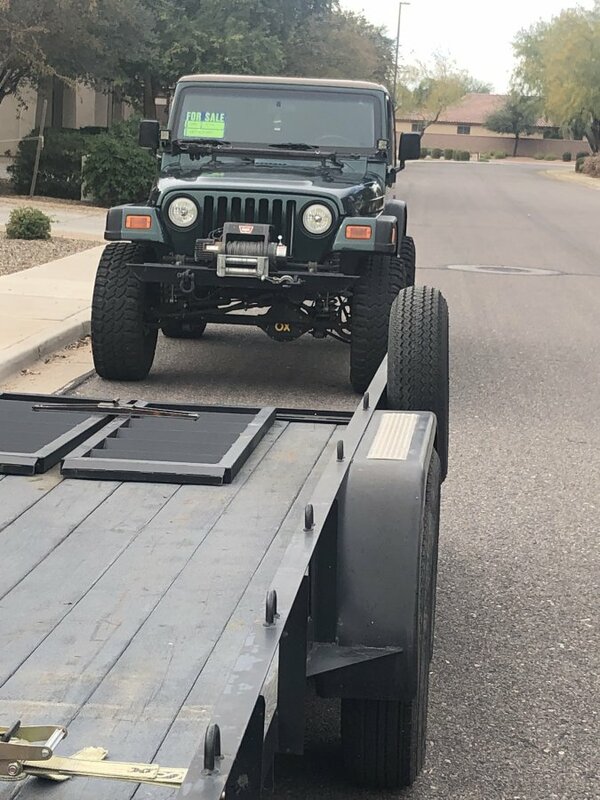 I purchased this TJ in Gilbert AZ. it was a long 700 mile round trip in my F150 towing a trailer. The TJ itself is in good shape. It's origin is a Sahara with an Automatic, AC (!!) and heater. It also has windows! crank up, but it will do. Our CJ never had a top, just a safari top and soft doors. This will allow us to go further and in comfort. I'll post up some details later but right now I am tuning up the Warn XD9000i winch. I want it to look good for the front stubby bumper I'm building. SKT, 07wurubi, Wojoe and 2 others like this. Suspension: Waggy leafs, stretched 1.5 in front and .75 in rear, cross over steering. Armor: Warn Rear bumper with swing out, Hanson offroad front bumper, Shrock works sliders, UCF tummy tuck. Congrats! now formulate a plan and then dont stray too far from the plan for your build. I have a plan, but $$ is the second stage hurdle. I'll list out the main parameters that I have bought so for. 2) Atlas II in a 5:1 flavor. 8) Add a small rack and rotopax carriers to existing rear swingout. The Jeep has a RE 5" long arm lift that uses a tracbar, RE sells a kit to convert to tri link and eliminate the tracbar. I'll do that when I get to the rear. For now I plan to get the D44 and all the extra stuff for the front end done first. I purchased the D44 from Robert at RWK Haus. Should have it mid Feb. I'm going to get the front fenders and stubby bumper going now. If time allows, I may have them finished before the D44 arrives. The fenders are going to be fairly involved. I'm going to eliminate the ABS. I am waiting on the brake lines and prop valve. I will also do a CAI while doing the fenders, it is supposedly easier than the stock box to work with. I will also add a trans cooler and a pusher fan while doing the front. It has a 3spd trans (TF 999?) and a NP28_. I know the ratio is not all that low. My CJ was running a SBC tied to a SM-420/D20 (w/terra lo) so I had loads of final drive. My hope is tro get close to what I had. I am just wrapping my head around the link system. The CJ was about as far as the leafs could go. I stretched, tweaked, re-mounted both ends as far as I think it could go. It was a crawler for sure. I could go lots of places and feel comfortable. It was locked and had built 44 front and back. I have a full fab shop that supports my main automatic weld shop that I run. So, I tend to build lots of stuff rather than buy. It is nice though to have sooo many parts ready to bolt on for my Jeep. 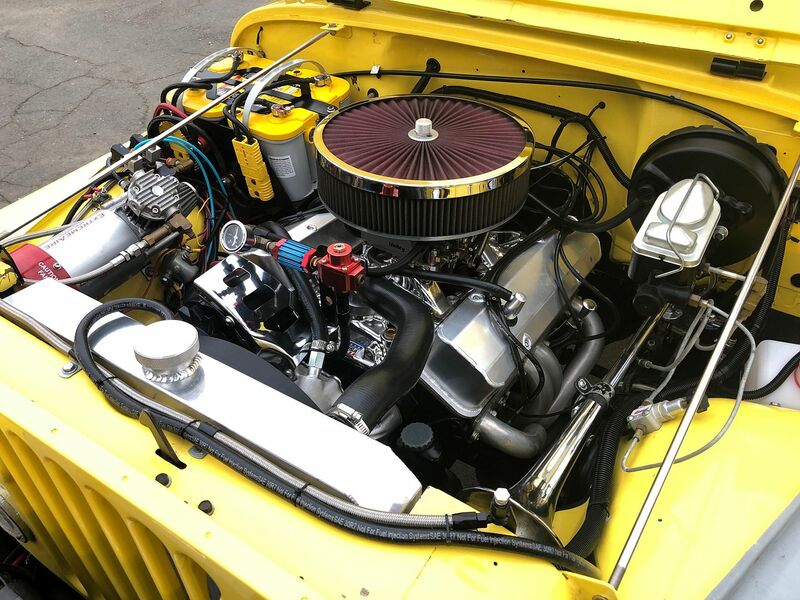 In the early '90s I had a '72 Scout II, shops said to get a CJ, cause parts were available. Well, in '08, I bought a CJ, just a few models too late LOL. Ben, SKT, Wojoe and 1 others like this. I’m looking forward to seeing your TJ build progress. Your quality workmanship on the CJ was something I always admired and enjoyed reading about. Accessories: OEM side steps for the kiddos! Receiver tow hitch with brake controller. Congrats! That CJ is sweet!! Welcome to the dark side, Tommy. Looking forward to seeing what you do with the TJ. Loved your work on the CJ - must have been hard to part with. Well, I have to go by experience here. I have broken every D30 I have had in some way or another. Usually axles on the front. My (tri county gear) D44 did very well, the Currie had a few advantages, it was cheaper and a Hi pinion. Yes, RE is Rubicon express. And you are again correct, it is not a steering gear but the links. I looked them over and chose these as they were as close to what I would have (and have) built, but fast forward with no build time. I am confident they are strong. The Atlas will be much less expensive in the end to get to the final drive ratio that I had in my CJ, It was a steady worker and would do as I asked. My intent is to build the same with an Automatic. In fact, the Automatic is the only reason I sold our CJ. It is all centered around this option. To do a Auto in the CJ was going to be another $4k (probably $5k the it goes for me). I sold our CJ in a moments weakness when the buyer did not flinch at my asking price. Could not pass it up. Now the TJ has MANY more nice things like doors (ohh yes! !Doors) AC, a true working heater, crank up windows (how awesome is that?). I did look at the aluminum options, not much more expensive but much harder to repair and keep maintained. Weight is a viable concern. I'll keep the trans for sure OK, so do we call it a 32RH or TQ999 around here?? There are not many "brands" for the CJ any longer. A lot of custom stuff that is well made and probably worth every penny, but I preferred to make stuff. My idea so far was to buy what I know to work and figure out the rest here in this section. The CJ section is loaded with great people and LOTS of knowledge, I'm hoping the TJ section is the same, I'm new and am open to ideas. It was hard to part with it. My son is getting to an age that a real vehicle is at his grasp. He has proved it on a few off road trips in our F150 (FX4). He has been in a go cart since the summer ending Kindergarten, now an RZR 170. He has shown an interest and some fair skill in the rocks, picking lines, etc. It's his turn. I'll build, he can drive. This will help him later in life (I hope) with driving, navigating, life skills etc.. It beats the games and devices any day as far as I'm concerned. Your choice obviously on the axle, but plenty of D30s on 35s with alloy shafts wheeling well and for a long time in JV and other difficult wheeling spots. U-joints are the weak point well before alloy axle shafts, R&P, etc. and that doesn't change with your D44. And you can actually get TJ shafts now that use the JK u-joints so easy upgrade there also. The RE steering links are OK. Currie are better, but I believe at least the RE stick to inverted Y. Too many "upgrades" out there go to inverted T which is not a good choice for TJs. Not sure what you mean by hard to repair or maintain for the aluminum armor and bumpers. Again, lots of people running 6061-T6 armor in very tough wheeling and they do nothing to it. Personally I've run aluminum rocker guards, rear corners, bumpers and full belly armor for 6-8 years (depending on the piece) and had to do absolutely nothing to them in regards to maintenance or repairs. And the weight savings was material. The transmission is a 32RH. While based on the TF999 there are modest differences. This is a tech forum and a little precision in terminology not a bad thing. Plenty of very high end builds of TJs that use short arms. Take a look at the work of mrblaine here on JF (Blaine Johnson). Arguably the best TJ builds out there. You will see either short arms or custom length arms. No long arms kits. With this move to links you should read up on link geometry and what it means for where the weight is carried on a TJ, how that weight transfers and reacts to the trail, etc. Almost all long arm "kits" make serious compromises as far as that geometry is concerned for purposes of ease of installation. Leads to poor performance. Additionally many long arm kits, potentially even including that RE kit, use a belly plate that does nothing to improve belly clearance in exchange for ease of installation. Poor link geometry and poor belly clearance are not remedies for success. Also, is that a radius arm kit? I can't recall. If so, another questionable design choice in this application. Not sure what about logic or math make long arms better. As just mentioned the link geometry (if that is math) is worse for almost all off the shelf long arm setups versus OEM short arm. The Internet does love to talk about the angle of arms and the impact of that ride comfort but that is complete red herring if you are thoughtful about what shocks you buy. Shocks are another interesting question. What are you thinking there? RE springs are known to have one of the highest spring rates out there for TJ springs. 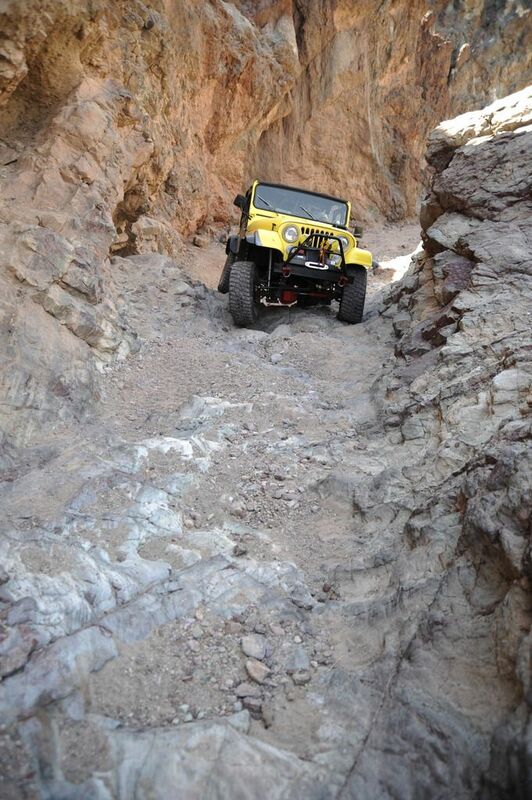 Very likely you are getting a full inch or more in excess of the advertised height unless the jeep is very heavy. Getting shocks of the appropriate size/length is very important to performance if you are spending this kind of money on a build. The RE kit does not have radius arms in front, by my definition. They are one arm pivoting at front of belly pan going to diff with a half/short arm connected to long arm. No radial movement. I can see trouble here. pinion angles, castor, etc.. The "belly pan mount" is literally flush against frame, maybe 1/2" (0.50") below frame and smooth (literally NO rock rash here or arms, don't think it has seen much action) I don't think it could go up much more. Regarding math and design of long over short, My job entails building Automatic weld equipment. Whenever I can lengthen a pivot point, I do, It means I will be back fixing stuff less often. Longer pivot points apply more leverage in the direction being forced. Can a long pivot be forced too much? Yes, but the force is the offender not the length. Longer length gives larger radius/diameter. A larger diameter will traverse a given object with less force than a short diameter. Skateboard wheels vs bicycle wheels, 33's vs 35's, etc. That is what I meant about logic and math of long over short. Am I to assume it does not apply in link suspension? Or is it a TJ only variable? Shocks, I have had good luck with properly tuned Fox 2.0 reservoir shocks. But if Something is better, I all ears. What about coilovers? is it feasible? Would keeping my existing springs and extending the shock perch/mount be beneficial? We used to tease (in fun of course) over in the leaf sprung CJ section about having "limit straps", is this needed when only one end is attached? Is there a difference in the search function here in this section than say the CJ section? I am wondering if it is simply my lack of knowledge and terminology that is the problem. One example is the ABS removal/eliminating/disabling thing that many have done. I have not found a decent or detailed thread on doing it. I am sure it is there. I see many disabling threads but none on removing or eliminating. Those are exactly radius arms. That upper arm connected to the lower has to rotate as axle cycles in contrast to both uppers and lowers connected to the frame. A design of questionable use, in particular as implemented by RE. Doesn't sound like the belly pan and mounts that would have come with that kit. Pictures would be interesting. I'm on my phone right now and can't get in to the details but you need to read a lot more about link geometry. Maybe another reader of thread can get in to detail or I can tomorrow. Not pretending that short arms are perfect, but longer does not equal better. Bracket placement, arm length and how everything works together becomes important. There are multiple force vectors at work and how they intersect and change as axle cycles can be interesting to think about. Almost all long arm kits do things for ease of installation that don't make for great results when you get in to those details. When combined with decreased clearance you end up with setups that will be easily out wheeled by good SA setups. 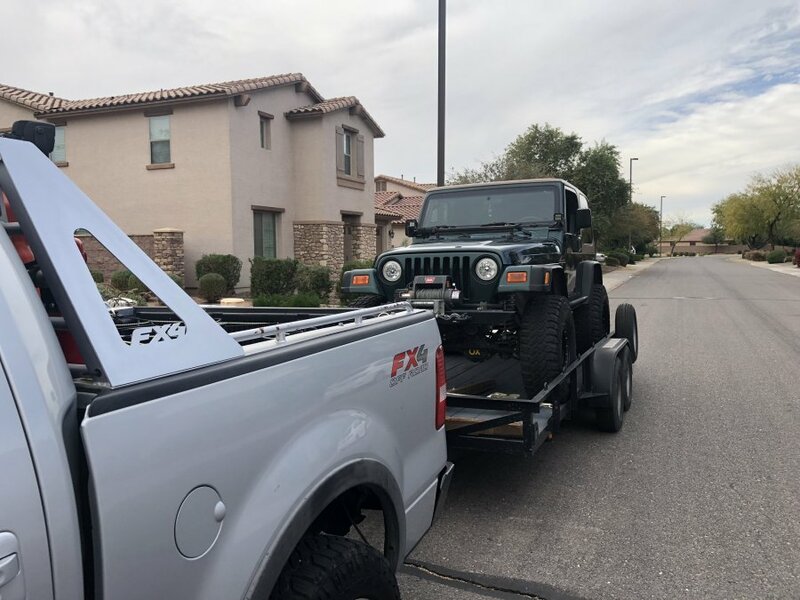 Tuned Fox 2.0s are a good choice but important to make sure have compressed and extended lengths that are a fit to what your jeep is (and as previously mentioned I bet you have arguably too much lift from those RE springs). Coilovers are a challenge on OEM TJ width axles. Just not enough room. Extending front shock towers and out boarding rear shocks with taller towers is a great mod. 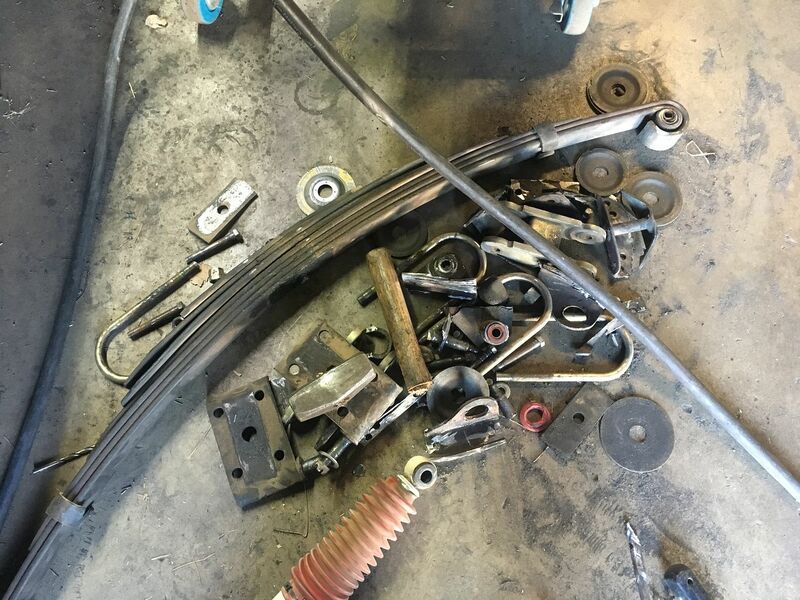 Limit straps can be necessary to avoid driveshaft bind and/or springs unseating. This all depends on travel. And if doing high speed they'll protect your shocks at full extension. Search function is kind of broken right broken right now site wide. We've been trying to get tech desk to focus but results a bit frustrating. You might get better results using Google and defining search as only to JF. Someone will chime in if I am incorrect, but I believe that you can get away without limit straps with regular shocks, but they are necessary with coilovers due to the inherent design of that type of shock body. They come apart on a hard extension without the straps. Biff’s points on the long arms are correct, but it is important to understand his comment on kits compromising for ease of - and sometimes straight bolt on - installation. There is a place for longer arms (flame suit on), that is why you have correctly pointed out that you don’t see ultra 4 cars with short arms, and also why Blaine’s mid-arm kit does use longer arms than stock. But given the size constraints of the TJ platform it is difficult to get the geometry correct to make them function well. I personally run longer arms, but I also run 14” coilovers and a 115” wheelbase which would not work well with short arms. It also took a whole lot of custom work to get the geometry in descent shape. That having been said, I probably could have gotten away with shorter arms, and it would have probably been easier to get my suspensions numbers in order. But the way, my rig started with the RE long arm kit, and I was never happy with how it worked - especially the radius arm front end. And x2 on the current status of the search function. Yesterday I was searching for something in my own build thread, and despite using terms that I knew I had used, it could not find what I knew was there. Jeff, what width are your axles? That combined with your wheelbase gives you a lot more options. And I'm pretty sure you've spent a lot more time than the average person fine tuning things. OP, I'll look around and see if I have any good articles or papers on the details of link geometry. I probably have something around here. I'm sure there are You Tube videos also, but I wouldn't want to recommend any without reviewing first as I'm sure there are some that are total garbage.